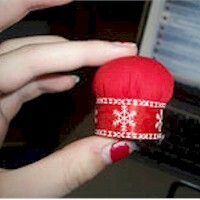 This delightful little Bottle Cap Pin Cushion will bring a smile to the lucky recipient’s face. It’s a great project to make as a recycling project and a great gift to make for someone who is an avid sewer. Note: Only responsible adults should work with a hot glue gun. 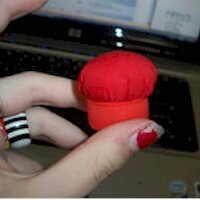 Use the photos below as a reference as you make these pin cushions. 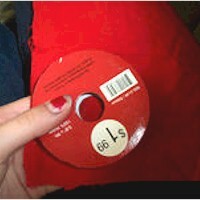 Cut out a circle of your fabric. I like to use a ribbon spool for measurement but you can kinda just eyeball it depending on how plump you want your pin cushion. 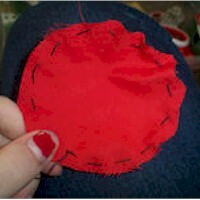 Sew a running stitch around the edge of your circle. Put a handful of stuffing in the middle. 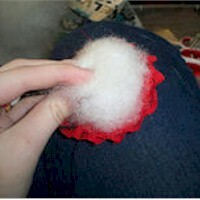 Gently pull your stitches to tighten the fabric around the stuffing. Make sure you push your fabric down while you pull so it all gets in there. Fill your bottle cap with some hot glue. Plop your cushion in there and push it down to make sure it is good and stuck. Now you can either leave it as is or cover the bottle cap. I like to use ribbon but you can also use fabric or paint the bottle cap. Whatever your mind can up with really. The possibilities are endless. 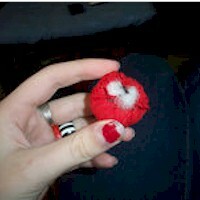 Sometimes I also like to attach ribbon and some velcro and make it a bracelet so my pin cushion is always handy.